Who are you? Christoph Adrian. What do you do? I am a musician in the band Brace/Choir. Where do you do it? In Berlin, Germany. That's where I'm from. What's different about your band's approach? We all are multi-instrumentalists and swap instruments after every song on stage and in the studio. We write each other's music, sing each other's songs and lyrics; we let each instrument speak with our different voices. The outcome is something that is much greater than the sum of its parts. Do you travel much for work? I take the bike to go to practice. On tour we usually find ourselves in a bus, a van or on the train. Do you carry a bag? I do carry one, it's a leathery manbag. That's what it is (see photo). 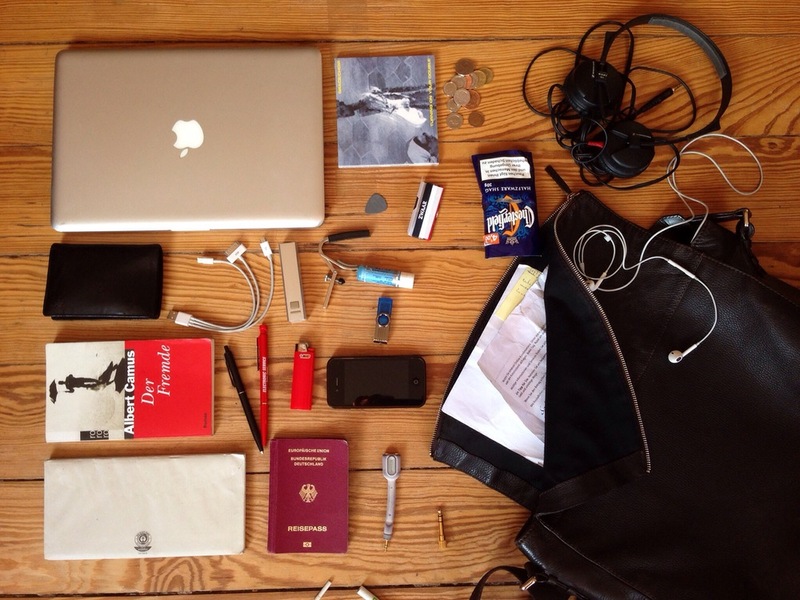 What's in your manbag, Christoph? Let's see. I've got my laptop, phone along with all the requisite cables, passport and wallet. It's also a graveyard for forgotten or abandoned pieces of paper, lighters and tobacco. Then there's the band stuff: plectrums, a capo, earplugs and copies of an album we've just released. What changes would you make to your bag to make your commute better? The system of adjusting the strap should be completely reinvented. I spend an incredible amount of time readjusting my bag. Thanks for that Christoph, we feel your pain. Let's see what we can do on the strap front. You might have to sort out the graveyard situation yourself, though. Although, we'll have a think! Commuters out there, share what's in your bag with us no matter where you are or what you do. Photo, list or a little film if you want. Or, if you find it easier, here's a little survey to fill in.